X-ray Photoelectron Spectroscopy Market size was valued at USD 540.0 million in 2017 and is expected to witness 6.2% CAGR from 2018 to 2024. Growing applications of XPS technology in medical field will ensure high industry growth during the forecast timeframe. XPS technique is typically utilized in plasma treatment of medical textiles. Plasma treatments include repairing the damages caused to tissues during a surgery or injury. Implantation of artificial meshes require improvement in surface properties that is carried out by upgraded XPS technology. Upgraded XPS technology is utilized in implantation of meshes that improves the surface quality. XPS improves the quality of implantation material and also reduces chances of surgical site infections that ensures high adoption rate of XPS. Moreover, XPS systems are also preferred in research and development activities for drug discovery that requires surface analysis of chemical synthetic and biological compounds causing a proportional increase in demand for XPS systems boosting the XPS market growth. Extensive use of XPS devices for manufacturing commercial products will augment the industry growth in near future. X-ray photoelectron spectroscopy devices are used in characterization of nano particles. These nano particles are analyzed for stability, environmental effects and functional behaviors. Accurate and efficient element detection carried out by technologically advanced systems will ensure high demand for XPS in forthcoming years. For instance, surface refinement properties and electronic properties of graphene layers are obtained by utilizing upgraded XPS devices. Refined quality graphene Nano-particles have industrial applications that proves beneficial for the industry growth. However, high capital requirement for manufacturing XPS devices may restrain the growth to some extent. Contamination detection segment was valued at USD 181.3 million in 2017. Increasing adoption of XPS devices amongst researchers and scientists for contamination detection should spur the segmental growth during forecast timeframe. XPS systems analyze adhesive bond failures to recognize the contamination and bonding chemistry within different compounds. Currently, key industry players such as Mitsubishi are focusing their efforts on R&D that will upgrade the technology integrated within the XPS systems offering lucrative opportunities for segmental growth. Element detection segment will experience 6.3% CAGR during the forecast timeframe. XPS is typically used in detection of alkali metals and non-metals that have commercial applications. Moreover, XPS also detects environmental nitrogen that helps in reduction of air pollution by maintaining the levels of chlorofluorocarbons in atmosphere. Aforementioned factors coupled with high preference for element detection in chemical industry for manufacturing certain compounds will foster segmental growth. Healthcare segment accounted for 31.8% in 2017 and is expected to show similar growth trends over the upcoming years. Increasing application of XPS systems in healthcare industry will positively impact the segment growth. Graphene derivatives are currently being utilized to develop cancer drugs. Superior quality nano-particles such as graphene are characterized by XPS system that boosts the demand for same, thereby augmenting segmental growth in near future. Semi-conductor segment will experience 6.6% CAGR during the forecast timeframe. Due to operational use and efficiency in data interpretation, XPS finds wide range of applications in semi-conductor industry. For instance, X-ray photoelectron spectroscopy is utilized for characterization for ultra-thin films in semi-conductor wafer processing. XPS technology has been extensively used in detecting the defects in semi-conductors that will augment the segmental growth in upcoming years. Monochromatic segment was valued at USD 427.7 million in 2017 and is expected to have substantial revenue share during the forecast timeframe. XPS devices fitted with monochromatic source of light are highly preferred among researchers due to the accuracy and efficiency possessed by them. Monochromatic source of light strikes parallel to crystal planes at an optimal angle that provides exact surface analysis of the compounds under study. Increased utilization of XPS devices with monochromatic source of light in medical and biomedical processes will propel the segmental growth in forthcoming years. Non-monochromatic segment accounted for 20.8% revenue share in 2017. Few industrial applications require non-chromatic source of light and is also provided as an optional light source type in some of the XPS systems. Non-monochromatic X-rays have photon energy of 1253 eV and using this type of light source will ensure minimum diffraction. However, non-chromatic light source renders the XPS equipment less sensitive in producing superior quality results in characterization of nano-particles. Non-monochromatic source of light has comparatively stunted preference and has fewer industrial applications that results in low segmental revenue share. 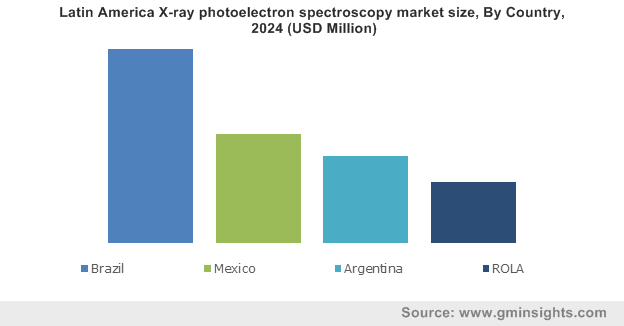 U.S. X-ray photoelectron spectroscopy market will experience 6.0% CAGR and is expected to grow substantially during the forecast timeframe. Increasing application of XPS in development of Nano-particles for cancer treatment will boost the industry growth. Furthermore, growing research and development activities and forensic researches will enhance the demand for XPS devices and augment market growth. Aforementioned factors coupled with favorable regulatory scenario will boost U.S. XPS market growth in upcoming years. 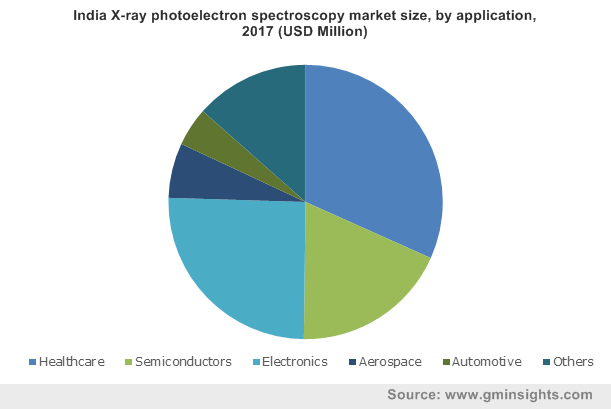 UK X-ray photoelectron spectroscopy market was valued at USD 27.8 million in 2017. Considerable revenue size of the UK XPS market can be attributed to the growing use of technologically advanced XPS systems in orthopedic treatments. Orthopedic disorders are more prevalent in geriatric population and growing geriatric population base in UK will foster industry growth. For instance, according to National Statistics, in 2016, 18% of the population was in the age group of 65 years and above. Majority of them have bone disorders such as arthritis will trigger the demand for treatments involving XPS thereby, stimulating industry growth. 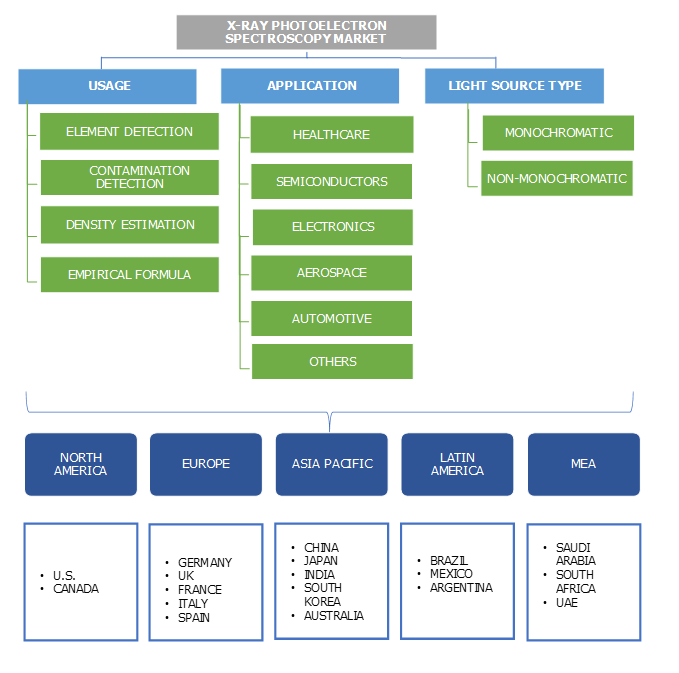 Key industry players operational in the X-ray photoelectron spectroscopy market include ESKO, Evans Analytical Group, Intertek, JEOL, Kratos Analytical, Thermo Fisher Scientific, V G Scienta. Eminent industry players implement certain strategic initiatives such as acquisitions, geographic expansions and new product launch, that enable them in sustaining market competition. For instance, in April 2015, JE0L completed the development of new XPS system possessing user-friendly interface and also has improved operability. Introduction of such new technologically advanced XPS systems by JEOL will enhance its profits. XPS industry can be traced back to 1900 and since then tremendous evolutionary changes has increased preference of XPS among the researchers and engineers. Tons of improvements in the instrumentation have render XPS technique useful for commercial as well as research applications. Nowadays the technique is used in myriad of industries including healthcare, semiconductor, electronics, chemical, aerospace and automotive. The industry is consolidated in nature with few players accounting for majority of revenue share. These players are putting efforts to develop technologically superior instruments to garner higher market shares. For instance, recently developed XPS devices are being used in quantitative characterization of DNA films. Such characterization studies are specifically useful in deriving solutions for treating various genetic diseases that will increase adoption of XPS devices. With technological advancements and increasing preference for X-ray photoelectron spectroscopy, its demand is set to increase substantially over foreseeable future.